As Mark Deneen, the owner of Juicy Music, said to me in an email: "1974 was a loooong time ago." 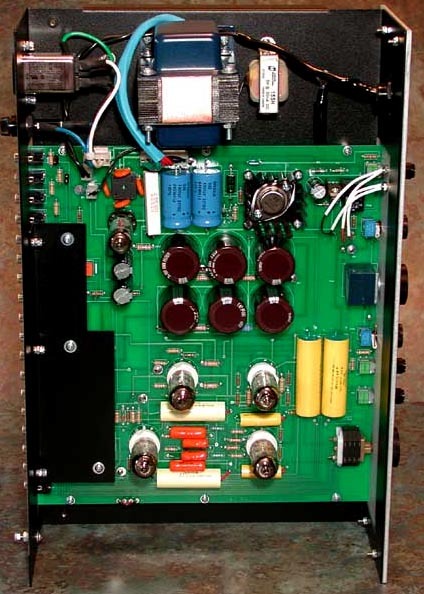 That is when Mark Deneen formed a small company, Paragon Audio in San Carlos/California and came to market with a new tube preamplifier based on a design licensed from Bruce Moore. This must have taken considerable courage at the time since tube equipment was fast disappearing and the only company still really serious about it then was the formidable Audio Research. Despite these odds, Paragon sold about 400 Paragon 12 preamps and 250 System E preamps. In 1978, the company sold to Audio Dynamics, a division of BSR, USA. Mark worked for them briefly until they dissolved, then went into the computer industry in Silicon Valley. He was not heard from in the audio world until his reemergence with Juicy Music in 2004 (shipping their first unit in April 2004). The company is truly a micro-sized cottage industry, with the only employees being Mark and his wife. All operations run through the web site, via advertising on AudiogoN and communications by e-mail. How about those unconventional company and product names, Juicy Music, BlueBerry and Peach? I know Mark lives in California but c'mon Mark -maybe back off the granola a bit? The Juicy Music BlueBerry preamp did not arrive in a fruit crate but was packed well. Opening the box, my impressions were of a handmade product with a definite cottage-industry look to it. This will not appeal to the Jadis or Hovland lovers but Mark has obviously made a conscious decision to concentrate on the circuit design and parts quality and leave the glitz to others. That makes sense to me. Since I broached the topic of packaging in my Hyperion review, I might as well make one niggling remark. Mark appears to have taken styrofoam house insulation and cut it to size for packing material. I see this done by some eBay stereo equipment sellers and it is a nice idea but the spongy, open-cell polyurethane foam would seemingly make for a softer landing if the carrier tosses the box off the truck. Perhaps just the bottom layer could be changed? The tubes supplied were: 1 x JJ Tesla ECC83S, 2 x EI Elite 12AT7, 1 x EI Elite 6DJ8 and an unbranded old stock 12X4 rectifier. The tubes caused some initial problems when I started playing records and found very little gain and some other obvious sonic problems. The first thing to do was test the tubes. In my Hickok 539B, the two EI 12AT7s tested marginal and the 12X4 rectifier was erratic. I contacted Mark who was understandably embarrassed but took ownership of the problem and asked that I return the unit for new tubes and a full checkup. Apparently, his tube supplier had done him wrong. Mark assured me that cages would be rattled. Besides the weak/bad tubes, a slightly cracked part needed replacement elsewhere. 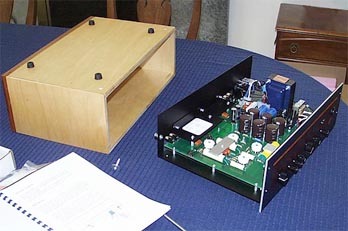 The preamp was repaired and returned within a few weeks. This time, Mark supplied me with some vintage RCA black-plate 12AT7s but one of them was terribly microphonic. Fortunately, I have loads of 12AT7s and easily replaced it with another RCA. All was well now and the preamp performed flawlessly ever since. Looking inside the preamp, it is readily apparent that Mark has put his money in all the right places. I must admit that the design strikes a sympathetic chord with my own biases. First, the power supply is tube-rectified and choke (C-L-C) filtered. 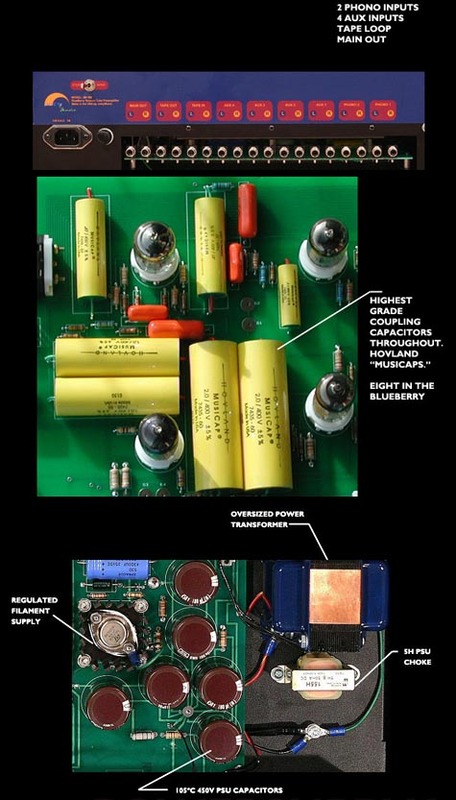 The high voltage supply is then further filtered through a RC filter network using six large 180 uF capacitors. Tube filament voltages are supplied by a solid-state bridge rectifier, which is C-R-C filtered and regulated by another solid-state device. While there is certainly nothing revolutionary in this power supply design, it is uncommon to find such a robust and well-executed power supply in a preamp at this price level. Phono equalization is done through a passive RIAA network and both phono and line stage circuits are open-loop designs with no feedback. Adding to the benefits of the good design work is the use of high quality parts, including ceramic tube sockets, Hovland coupling caps and an Alps master volume control. tweaking. (FYI, I tried my PS Audio Mini Lab, which did not seem to be an improvement in this case.) The rear panel has a wealth of PCB-mounted RCA input jacks, including a tape loop, four line level inputs and two phono inputs. My BlueBerry was set up for moving magnet input (47k loading), but Mark also offers a moving coil input option utilizing Jensen input transformers for the additional gain. The owner's manual is a model of clarity and conciseness. There is no BS, no misspellings and even good information on Mark's design philosophy. I first installed the preamp in place of my Hovland HP-100 in my downstairs system. I only compared line stages here since the BlueBerry's phono stage was not configured for my low output Roksan Shiraz moving coil. Fresh off the Hyperion speaker review, I put in the Leonard Cohen Ten New Songs CD again since I was quite familiar with it now. The first thing that hit me was a nice big soundstage with lots of bloom. This was not unexpected given it's an all-tube preamp but it surely reminded me of why I like tubes. It did not have a fuzzy, syrupy tube sound. The preamp was very quiet too, with only a very faint tube hiss present when the volume control was cranked up all the way on both phono and line. At normal listening levels, it was dead quiet. Comparison to the Hovland is not really fair given the much higher cost of the Hovland but it does serve as a reference point. The BlueBerry does not have the image focus of the Hovland nor is it as refined and informative on transients. On the other hand, the BlueBerry portrayed vocals wonderfully and with a slightly greater sense of ease. One of Srajan's 6moons compilations for CES 2004 has been a reviewing workhorse for me as well as being thoroughly enjoyable. Cut #6, Sera Una Noche's "Betonotti" from La Segunda is a haunting piece with astonishing image depth and a female vocal that is a tough test for a system. While the BlueBerry does not portray the images with sharp outlines like the Hovland, it does allow one to see into the rear of the soundstage. Image sizes are of proper proportion, too. Soundstage width is excellent. The vocal in this cut can take on a bit of hardness in some systems but the BlueBerry rendered it as well or better than I've heard anywhere. There was a natural fullness with no hard edge. As I learned with further listening, this is a hallmark of the BlueBerry's sonic signature. Vocals are simply sublime. The BlueBerry has superb tonal balance. Cut 14 on the same 6moons disc, Ziroq's "Voices" from Ziroq, I found again that the BlueBerry does not call attention to itself in any one particular performance aspect. It presents music in a very even-handed way. There is no sense of any frequency anomalies. Highs are extended and clear with no tizziness or emphasis. In one email exchange with Mark, I was asking him about the design. He said he worked hard to get a sense of clarity, especially from 1kHz on up. He has succeeded. This clarity is achieved without any cost of edginess or harshness in the upper mids. A compilation CD that I used during the Hyperion follow-up, Jazz Like You've Never Heard It Before [Polygram 819 344-2] illustrates this well. The strings and horn on Ella and Louis' 'Summertime" were just wonderful. In fact, the upper mids were downright creamily smooth. Please do not misconstrue this to imply colorations - not at all. Not to get in a rut, I put in another CD I used with the Hyperions: Bassology's The Feeling That I Get [Reckless Music RMCD-1024]. This CD is a great test for handling of bass in both power and pitch. The BlueBerry did very well, the only difference between it and the Hovland being a slight rounding off of leading edges. The bass was not quite as tight as with the best tube preamps but was powerful and satisfying. Up until now, I had been using the preamp with a later version (round getter) Amperex 6922 in the line stage rather than the stock EI Elite 6DJ8. I switched to a selected Yugoslavian EI 6DJ8 that I got from R.B. Audio for my Bruce Moore Audio Design Companion preamp back in the mid-90s. This tube has a very detailed sound, which went a ways towards improving the detail in the BlueBerry's line-stage performance. This tube also took the vocals and soundstage depth up a notch. It is definitely worth tube rolling in the line stage. (along with a variety of other music). But this doesn't mean that the preamp is not good with other types of music - it is! To test out the phono stage, I brought the BlueBerry upstairs to mate with my Thorens TD-125 Mk.II. Several amps took turns in the system, too, rotating through my Leak ST-20, Pilot SA-260 and modified Leak TL-12+ monoblocks. In the end, I did most of my listening with the Pilot amp. First up on the turntable was Miles Davis, In Person, Friday Night At The Blackhawk, San Francisco, Volume 1 [Columbia LE 10018 reissue]. After only the first few seconds of crowd applause followed by Miles' horn, I said to myself "Wow, this is something special!" Permit me to digress here. Are there others like me who have spent the better part of the past six or seven years trying to find a full-function all-tube preamp with a really good phono stage? This has been a tough mission for me. I ended up having to cough up the serious dough for the Hovland. Fellow travelers, rejoice in the BlueBerry because this preamp's phono stage is startlingly good. Anyone who's read my bio would surmise that as a vintage audio gear lover, I probably do my fair share of tag sales. I do, indeed! Of course, records are a major tag sale treasure for me, too. I must admit to purchasing fewer CDs for myself in the past two years than I have as gifts for others. However, don't think I'm not getting new music all the time. For the price of one CD, I'm picking up ten or fifteen LPs. Clean them up on the trusty VPI 16.5, cull the bad ones and you've got all the "new" music you need. Now, back to Miles: The BlueBerry just floored me with its phono stage performance. This level of phono stage performance in a preamp at this price point is something to shout about. 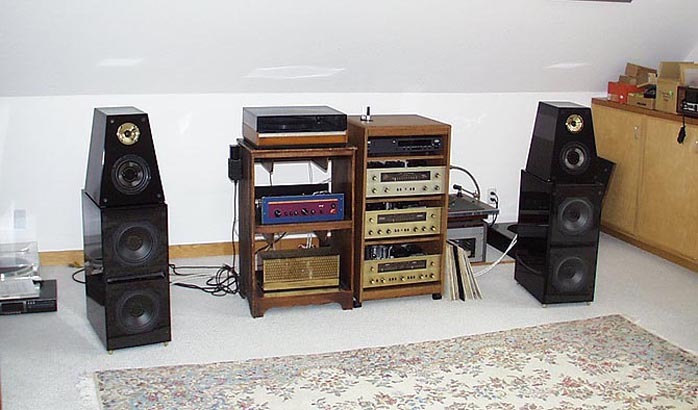 Perhaps it took someone like Mark who was last designing when LPs were still dominant and may have been out of touch with the slow disappearance of -- or half-hearted attempts at -- onboard phono stages in preamps over the past twenty years. What an honest and commendable effort he now put into LP playback. Mark, welcome back! This Miles Davis LP is a very special recording, with Hank Mobley on tenor, Wynton Kelly on piano, Jimmy Cobb on drums and Paul Chambers on bass. What more could a jazz lover want? I just had the most stupid grin on my face the whole time. The incredible rhythm of this performance, with Kelly's percussive left-hand piano counterpoint to Chambers' bass, was just freaking fabulous - yes, I'm gushing! I did a little tube rolling with the BlueBerry phono stage too and found a very nice combination. This tube complement gave the preamp just the right balance of guts and sweetness while the low-noise front-end tube made for a very quiet background. For a taste of classical music, I tried out McCauley's "Five Miniatures for Flute and Strings" and Barlow's "Night Song" on Mercury SR90277. This is on the flip side of the Loeffler Deux Rapsodies. It is an extremely natural-sounding recording. The first few notes went right to my heart and I felt that emotional connection to the music that lets you know things are right. Suffice to say that I immediately started digging through my latest pile of record purchases. A few days later, I went back to the line stage in the upstairs system. The Mercury 432 014-2 CD French Opera Highlights is a favorite of mine for portrayal of large-scale dynamics and hall acoustics. I know some of it is the "Bugs Bunny" cartoon theme music but the full-tilt orchestra interspersed with quiet interludes on the time-worn "Overture to Zampa" by Herold is an excellent evaluation tool. The dynamic contrasts were very good but again not quite on the level of the best preamps. The string tone, which is notoriously tough on a lot of Mercury recordings, was outstanding, however. I confess that I have a soft spot for funk, from James Brown as a youngster through Sly and the Family Stone, Tower of Power, Rick James and now Outkast (not the rap that is also on the CD). When I saw Outkast in their premier appearance on the Tonight Show, I just howled. Andre 3000's wacky tennis outfit getup, Afro hair and some truly innovative choreography for the backup dancers gyrating to "Hey Ya" was like a breath of fresh air. Finally, something new in pop music. So, I slipped Speakerboxx/The Love Below into the CD player and let it fly. It's a good thing my neighbors are not close because I just cranked this up through the roof! This CD simply thrived on the BlueBerry's vitamins. This preamp does full justice to a high-volume dance party if you're so inclined. After the initial malfunction and the bad tubes hiccup, the BlueBerry was a complete joy to use. The BlueBerry presents music as an organic whole, with its minor errors being subtractive in nature. Keep in mind that my few criticisms were only in comparison to much higher priced equipment. The only comparatively priced full-function tube preamp competition that comes to mind is the JJ Tesla 243. I've had the JJ preamp in my system before. Going on recollection alone, I believe the BlueBerry is better. Transcendent Sound offers separate tube line and phono stages ($1700 assembled + interconnects) but their parts quality is not as high. Wright Sound also makes some nice all-tube components but I have not compared them directly to the BlueBerry. The Juicy Music BlueBerry is an honest solid product that gave me a nostalgic whiff of the pre-insanity audio pricing of the 1980s. It delivers the goods without the nonsense. If you are still looking for a full-function tube preamp but don't have the money for the premium spread, this is the way to go - especially for vinyl lovers! We've had a lot of fun this afternoon reading Stephen Marsh's BlueBerry review and I thank you and Stephen for talking a taste of our homemade "juice." It's always with great trepidation that any designer turns a piece of work over for professional criticism. In spite of all the technology we have at out fingertips, audio design is still at least half art. A good bit of it is like making wine. A project such as BlueBerry involves hundreds of conscious decisions, tradeoffs and compromises that must ultimately be arbitrated by one's own intuition and sensibilities. Will the design goals show through on their own? Will anyone get the essence of this thing without explanation? That's what keeps me up at night. I'm pleased to tell readers of this review that Mr. Marsh has squeezed the exact essence from BlueBerry. And that's all I could ever hope for in a review. 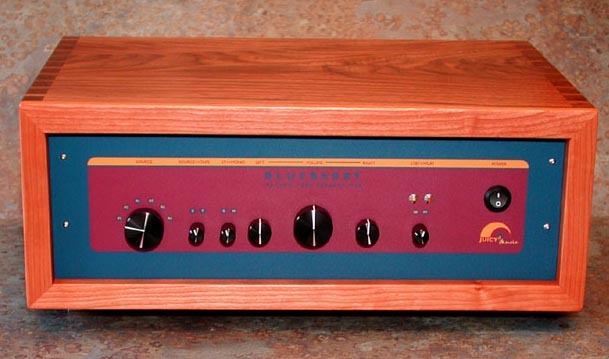 The BlueBerry was conceived as phono amplifier -- knowing that many if not most records in a collection are not perfect recordings -- but must still render the music in a fun and pleasing way. It appears Mr. Marsh experienced that with BlueBerry, pretty much matching my original intentions for the product. Juicy Music, as Mr. Marsh correctly described, is a small cottage business. We're not small hoping to become big, we are just small hoping to become better. I am dedicated to the traditions of craft. In particular, such traditions as perpetual improvement, taking complete individual responsibility for whatever we produce, and providing a kind and quality of service that may have died when gas was 39 cents a gallon and guys would check your tires, oil and battery, then wash all your windows. On the down side, we do use rigid board insulation for packing instead of molded foam because - we have no place to store 3,000 cubic feet of foam! Mr. Marsh imagines we've OD'd on California granola with our whimsical use of color and names like Peach, BlueBerry and Cream. And believe me, sometimes I stand back and say to myself, did I just name that thing BlueBerry? But mostly, it's a result of my quest as an audio craftsman to make things by individual imagination which are not vetted by committees or focus group consensus (although my wife does reign me in when I get too far out). Having already designed 2 or 3 big, black, ominous boxes of knobs back in the 70s, I just couldn't bring myself 30 years later to do that again. Thank you 6moons, and thank you Stephen Marsh for checking out our wares. We're most appreciative of your time, attention and thoughtful analysis. Stay tuned. We have lot's of new and interesting things growing here in the cottage gardens!